Home > Science & Nature > Geography > Utah: Herriman Fire Pictures? A Herriman wildfire has forced the evacuation of more than 1,000 homes in Utah. Several homes are engulfed in flames and it is on its ways to others. Helicopters have been brought in to drop buckets of water and fire retardant to fight the blaze. Over 100 firefighters and 30 units are working to control the flames. What started the Herriman fire? Have there been any injuries? Herriman Mayor Josh Mills has signed a declaration of State of Emergency, according to city emergency management coordinators. Herriman city officials and police officers are working to assist with evacuations and notifications. Evacuations have expanded to include all addresses in a zone bounded by the county line at the south, 14000 South on the North, 5575 West on the east and 8400 West on the west. All Salt Lake County residents were asked not to use their cell phones to keep lines open for emergency communications, and volunteers worked to evacuate animals from the area. A picture recently taken by the Salt Lake Tribune. Fire fighters from surrounding counties have been called to the scene to help fight this fire. The current Herriman fire fighters which have been fighting the flames for hours have started to take shifts to protect their health from the heavy smoke exposure. Video of a home engulfed in flames from the Machine Gun Fire in Herriman. The area on fire jumped from an estimated 300 acres to 3500 acres overnight. Four houses are in total ruin; many others have been scorched or experienced less damage. All buildings in the area are considered at high risk. There are some places where people is being allowed to return to their homes to gather belongings, but police is asking that anyone without a significant reason for being in the Herriman area to stay away because of the intense fire. 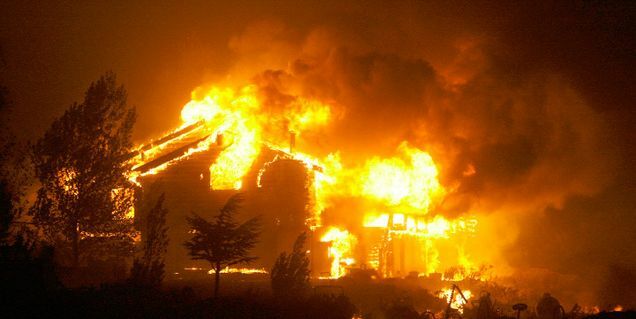 Similar Threads for: Utah: Herriman Fire Pictures? Utah Firing Squad Execution Video?